This recipe was found on Garden Goose, and Tina graciously allowed me to share it with you. Thanks, Tina! My family oohed and ahhed as they enjoyed this treat. 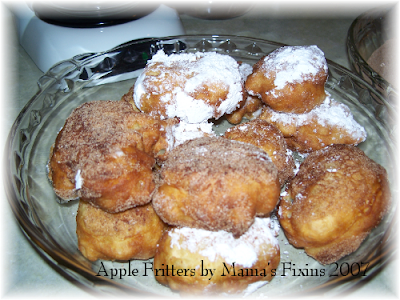 It's similar to a funnel cake, only laced with apples. My crew preferred the powdered sugar to the cinnamon sugar combination on the outside. This would be a perfect special breakfast treat! It's similar to a donut, and cooks up quickly. Sift together dry ingredients. Gradually add beaten eggs and milk combined. Refrigerate batter for about 2 hours. Drop by tablespoon into hot oil and fry until golden brown. Roll in powdered sugar or a sugar/cinnamon combination. Thanks for sharing it. I can't wait! okay so......if you eat these while standing up they have no calories. right?